Comparing Linux hosted to Windows hosted ASP.NET Core applications in Azure Application Service Plan – Roberto Prevato – Applications architect, DevOps, graphic designer, metal head passionate of philosophy. What is faster? An ASP.NET Core application hosted inside a Linux machine and Docker container, or one hosted in a Windows machine, when using Azure Application Service Plan? Which setup offers the best performance, and to which extent? In both cases, the application is built using dotnet CLI in Release configuration, hosted using Kestrel, behind the proxy server used by Azure service. Each application has a dedicated Standard S1 service plan, therefore a dedicated virtual machine. Contextually, I also compare the Dockerized ASP.NET Core application to other technology stacks I’ve been testing in the last days (Go, Python 3.6.2, PyPy 3). Since Kestrel is internally using libuv, it will be interesting to compare it to uvloop, being the latter a wrapper for libuv and asyncio (Python built-in infrastructure for creating concurrent code). I think that many NET developers are proud of Kestrel’s speed and the job done by Microsoft engineers, but ignore they should also thank libuv: a C library for asynchronous I/O that existed before and is used by Node.js and other applications. And also that, when behind IIS, it requires some extra considerations. For the deployment to Windows machine, I rapidly created a project in VSTS (Visual Studio Team Services), provisioned the services using ARM templates, built and deployed the application using VSTS tasks. Application source code and ARM templates are here in GitHub: https://github.com/RobertoPrevato/ASPNetCoreHelloWorld. The Docker image has been prepared and published in the same fashion I described in my previous posts, about running Docker images in Azure. Since I already described the process there, I am not going to repeat it here. The only thing worth mentioning is that it’s not possible to mix Linux and Windows Application Service Plans inside the same resource group, so I created one resource group for each instance of the application. Application source code and files for the Docker image are here in GitHub, together with ARM templates: https://github.com/RobertoPrevato/AzureDocker. 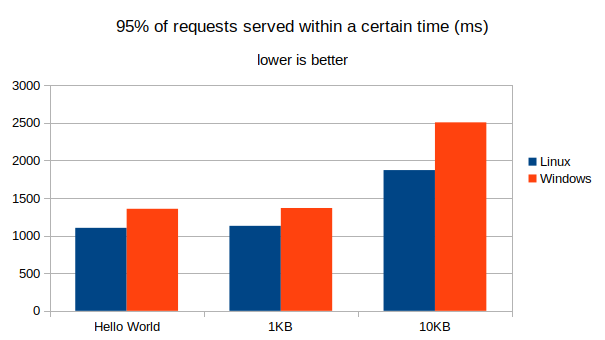 About 250K successful requests were submitted for Hello World, 1KB scenarios, while between 110K and 70K for 10KB and 100KB scenarios. 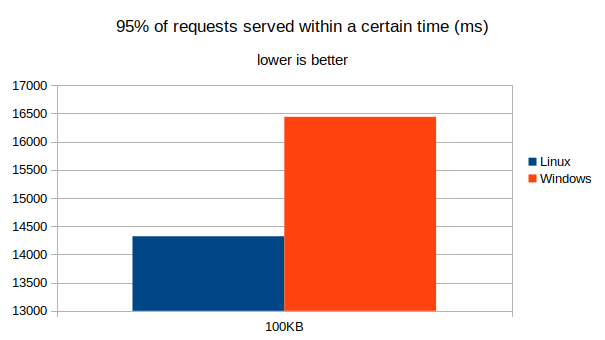 Numbers are not exact because sometimes the Azure infrastructure closes the connection (“connection reset by peer”), but number of analyzed requests is high anyway. Do not pay particular attention to absolute values below: they make sense relatively to each other, since they depend on the client as well as on the server. Results below are obtained using a wi-fi connection. 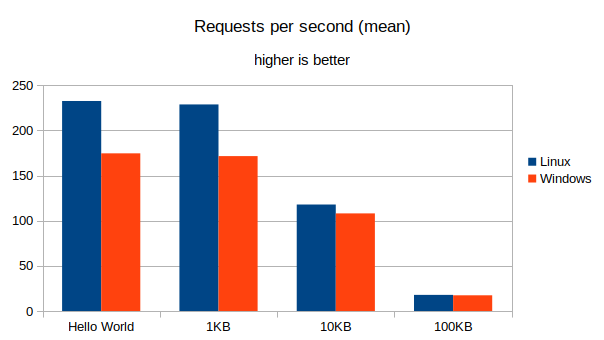 Results show that the same application hosted in Linux and Docker is much faster in handling HTTP Requests, when response body is small. The difference fades off as response body size increases, although the Linux setup is still slightly faster than Windows. This may seem surprising, since Windows hosting in Azure Application Service Plan is a more mature technology. On the other hand, Docker virtualization is cheap, compared to other ways to virtualize applications. There may be other configuration differences that make Linux host more efficient, which is especially visible for small response bodies. Nevertheless, it’s legitimate to compare results with each other, when they are executed from the same client and using the same tools and configuration. 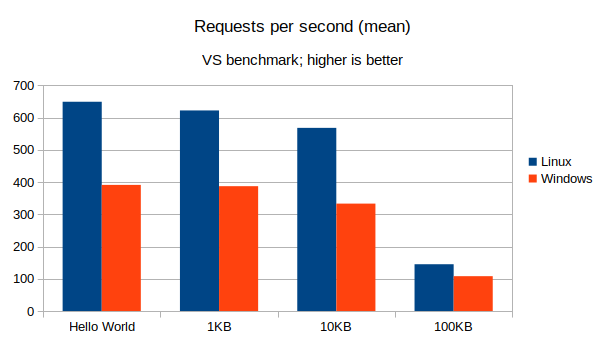 This doesn’t remove value from performance comparison between Windows hosted and Linux hosted ASP.NET Core application. Hosting applications using Linux and Docker in Azure Application Service Plan doesn’t affect negatively the performance of the application, unlike one may guess, given that Windows hosting is more mature. 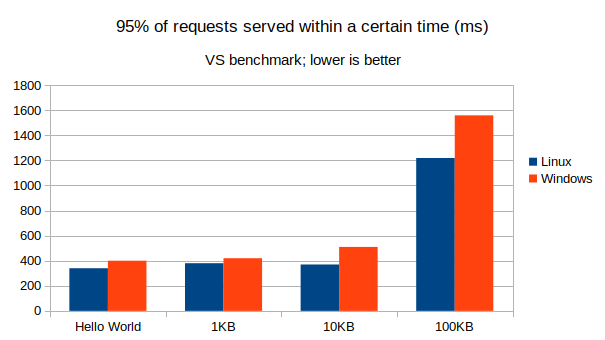 It is actually beneficial, performance-wise, especially for requests returning responses with small bodies. In my following post, I repeated the tests in the cloud, using Azure Cloud Agents; with Visual Studio and VSTS.